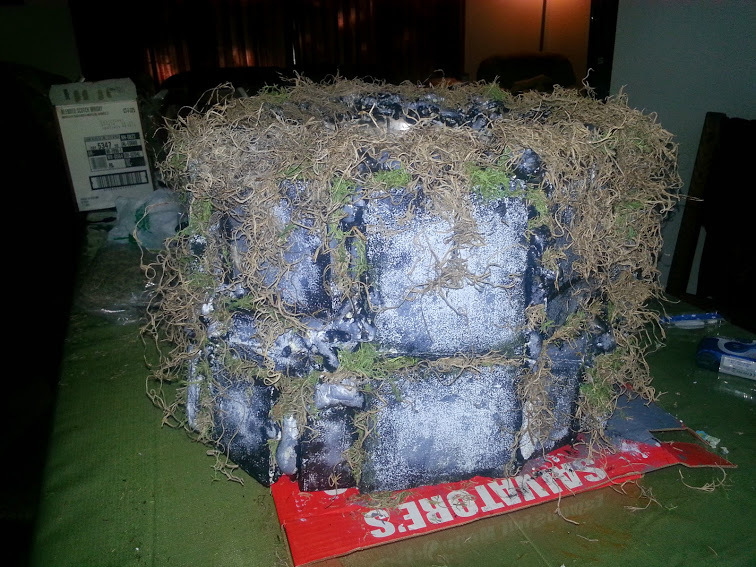 It has come to my attention that this Frugal Gal ( under my old website name DebsDreamThemes) has been highlighted in Haunted Attraction Magazine and Inventorspot.com has recognized one of my props as 10 Epic DIY Halloween Decorations Sure to Make Your Guests Freak. For me, this is like getting an Emmy. 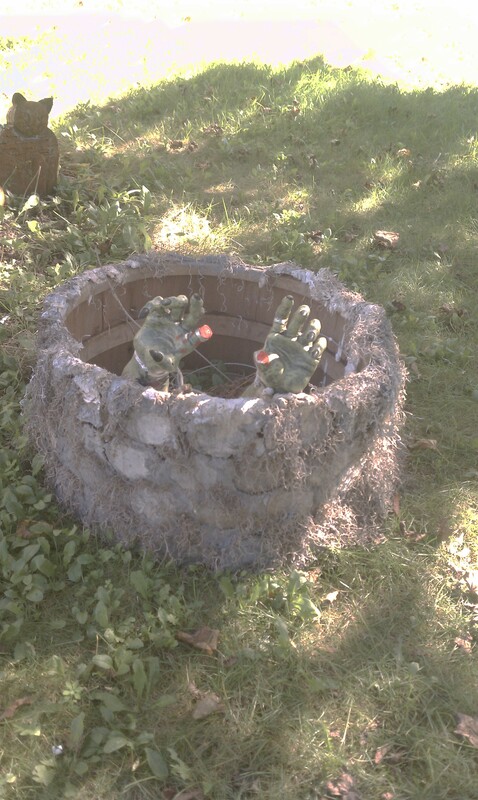 It took about 45 castings of stones to replicate a well from the movie The Ring. Photo courtesy of Debbie Morrow, All Rights Reserved. The prop that has drawn much attention is my Ring Girl and Well prop (you can also find another, easier way to make the well since the first version needed to be replaced). I have to laugh a bit. 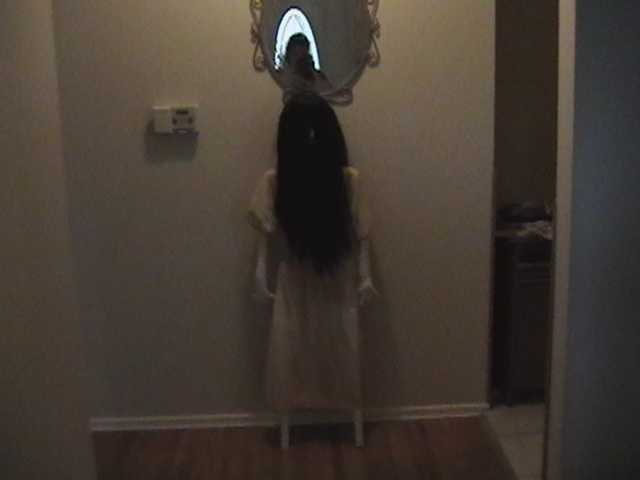 Samara (the Ring Girl’s name) was the second prop I ever made and the reason I made it was because the movie The Ring, terrified me so much that I wanted everyone else to get that same feeling. New replacement for old well. It was so much easier to make and weighs no more than 5 pounds. Image courtesy of Debbie Morrow, All Rights Reserved. I searched for hours and days looking for how to make it and couldn’t find it anywhere. I thought: Why are they not selling it or making it somewhere? That’s when I took the leap (about 8 or 9 years ago) and cut my first piece of PVC pipe. After that, I was sold on creating life-sized props. The first year or two when Samara and the well were placed in the yard, I had people stop by and tell me they had to take a new route leaving their home. Their families were too disturbed to see the girl in the yard. I told them that was exactly the response I was looking for. Another woman stopped by to tell me how she was going to call and complain how I was making a child stand there outside for so long for the sake of scaring people. She said after a few times going by she realized it was not a real child, but a prop and had to stop to tell me about it. Those moments made my day. It also taught me props don’t have to be perfect to convey the message. I’d like to thank my followers and supporters. You’re probably wondering why more posts on Halloween haven’t appeared lately. The reason: We’re moving to another state and packing takes an enormous amount of time. During the move, I’ll try to highlight a few friend’s awesome ideas. You may not even know their sites exist, but they are quite talented. Thanks again for stopping by and sharing comments. If you have an unique haunt idea you’d like to share, please send me a comment. I’m more than happy to share your ideas with others. Thanks! This entry was posted in Casting, How-to-Make Ideas, Props, Seasonal Decorating and tagged DIY, Gratitude, Moving, Prop making, Samara, The Ring Girl by thewritegirlforthejob. Bookmark the permalink. Congrats on the honors, and good luck with the move – it is a massive undertaking, to be sure. I’m one of few who have never seen the Ring. Probably never will. I’m such a sissy!